This is one version of the Barnabite logo. of poverty, chastity and obedience. The Barnabites, or Clerics Regular of Saint Paul, are a Roman Catholic order founded in 1530 by three Italian noblemen: Antonio Maria Zaccaria, Bartolomeo Ferrari, and Giacomo Antonio Morigia. The order was approved by Pope Clement VII in 1533. The name Barnabites is somewhat of a nickname and comes from the association of the order with the church of St. Barnabas in Milan. Members of the order make vows of poverty, chastity, and obedience, as well as a vow not to strive for high office or positions of dignity. Their activities are focused on ministrations in hospitals and prisons, and on the education of youth. They are particularly devoted to the study of the Epistles of Paul (due to the relationship between Paul and Barnabas described in the New Testament Acts of the Apostles). There is also a female branch of uncloistered nuns, the Angelic Sisters of St. Paul (founded in 1535) and a lay congregation for married members. The garb worn by members is the black cassock (tunica talaris, meaning "to the ankles") as worn by Milanese priests in the 16th century. Today, they have a formal presence in sixteen countries. 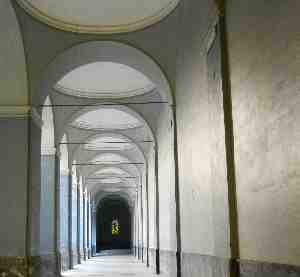 The presence of Barnabites in Naples goes back to the beginnings of the 1600s. Lucio Pallamolla, originally from Sapri, south of Naples, asked to join the Barnabite order and placed money at the disposal of the Congregation in order to open the order in Naples. In the early 1600s the order moved premises a few times—to the church of S.Arcangelo sotto Forcella and the church of S.Caterina Spina e Corona—before winding up at one of the most historic religious sites in Naples, the church of S. Maria in Cosmedin (also known as S. Maria of Portanova). The spiritual, educational and charitable activities of the order were interrupted by the French Revolution and subsequent closure by king Murat of all religious orders in the Kingdom of Naples in the early 1800s. Religious orders, including the Barnabites, were reestablished after the Congress of Vienna (1815) and the restoration of the monarchies in areas formerly under Napoleon's control. The order moved a number of times throughout the 19th century, a time during which there was also a second expropriation (in the 1870s, shortly after the unification of Italy) of properties owned by monastic orders. 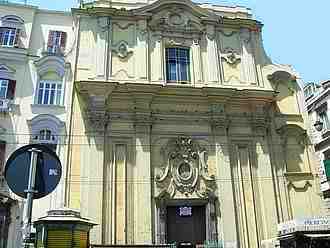 In 1821 the Barnabites acquired what is still their current church, S.Maria of Caravaggio (photo, left) at Piazza Dante. The church was built in Naples in 1627 on the site of an earlier, smaller house of worship and was originally in the hands of the Scolopi (Scuole pie) [Pious Schools]. The church takes its name in honor of an apparition of the Blessed Virgin in the town of Caravaggio (near Milan) in 1432. The church and adjacent monastery were then rebuilt in the 1730s by Giovan Battista Nauclerio (1666-1739), one of the great architects of the Neapolitan Baroque. The church and adjacent premises were reorganized as a school, the Royal College of Caravaggio, and given to the Barnabites in 1821 by king Ferdinand. The order had the church rebuilt in 1843. Following the suppression of monasteries after unification, the monastery adjacent to the church was converted to a school for blind children and for a while also housed a local historical society, Storia Patria Nostra, There are still significant art treasures within the church, including works by Francesco Solimena and Domenico Antonio Vaccaro. In 1943-46, the church also served the English speaking Roman Catholic members of the Allied Forces in Naples. In the 1870s the order came into possession of the premises that still today serve as its main educational institution, the Collegio Bianchi, now called the Istituto Bianchi, located at Piazza Montesanto near the bottom station of the Montesanto cable car and the Naples terminus of the Cumana railway line. The institute is named for a member of the order, Francesco Saverio Maria Bianchi (1743-1815). The school has a respected and comprehensive curriculum for elementary school through lyceum (high school) and is housed in the former monastery (photo, right) built to serve the adjacent church of S. Maria of Montesanto. Construction of both monastery and church was started in 1647; the architects were Pietro de Marino and Dionisio Lazzari. The premises originally served the Carmelite order. The school has had a varied history, including service as a hospital during WW I.